The book is billed as Lovecraftian steampunk fantasy, which is to say that it takes inspiration from the otherworldly horror stories of H.P. Lovecraft and the speculative alternative history of steampunk sci-fi. In its execution I would also add ‘noir’ or ‘mystery’ to the genre. It’s a good mix, and the various pieces work well together.The story’s protagonist is Tavlin ‘Two-Bit’ Metzler, a professional gambler and general rouge living in the subterranean city of Muscud, on the banks of the Atomic Sea. This city is one of several underground cities primarily inhabited by mutated humans, but also inhabited by ordinary uninfected humans, mutated animals, and members of various sentient pre-human species (some rather slug-like, some blob-like, and some arthropod-like). These cities are in the sewers of the larger metropolises above ground, and their primary authorities are multiple religious cults and various rival gangs. When Tavlin’s old friend and full-time mob boss Vassas has several members of his gang die under strange circumstances, Tavlin is asked to investigate. His investigations put him in the middle of a dangerous adventure centering on a strange weapon which the cults and sentient pre-humans are all desperate to get their hands (or tentacles) on.The best thing about this book was its incredible level of description and texture. Muscud and the cities near it are disgusting places. They’re slimy, they stink, everything is damp and crawling and infected, and the descriptions are writing with skin-crawling vividness. All of the mutant creatures, all of the alien-like underworld denizens, were described excellently. The quality of the writing was also very good, with few errors. I did feel like the characters drew heavily from crime-drama clichés, but that’s not so terrible. These kinds of characters are used because they’re effective. Maybe we’ve all seen movies with some fedora-wearing cigar-chomping pistol-waving mob boss shouting profanities before, but that doesn’t diminish the character’s entertainment value.The book was heavy on action, with chases and gunfights familiar to anyone who’s read or watched any kind of mystery or crime dramas. The difference of course is that these fights are here taking place in a slimy underground city, which allows for some different approaches. The fights were well-written as well, however due to the way the story uses them, I would dispute the book’s Lovecraftian label. In a Lovecraft story, there is always a sort of creeping dread pervading the narrative. The characters in a Lovecraft story are victims of hellish otherworldly forces gradually driving them into unspeakable terror and insanity through the influence of eldritch alien gods. In Atomic Underworld, there are (or at least seem to be) eldritch alien gods , and there is dread, but the dread doesn’t pervade the narrative. The book doesn’t feel like a horror story. With a cocky rogue for a protagonist and with mobsters out of a 1940s noir film chasing each other through an urban jungle, the book feels more like action/adventure than it does horror. This isn’t a bad thing, but it is worth noting. It’s also worth noting that this book ends on a complete cliffhanger, which may annoy some readers.On the whole, I enjoyed it. The detail was impressive and the story was engaging, and the odds are good that I’ll buy and read the second part of it. I enjoyed Jack Connor's The Atomic World Volume 2 more than I did the first one. The reader finds out exactly who the mystery woman is and what her intentions are. That's all I'm going to say in order to not spoil it for other readers. The characters become more developed in this volume and the descriptions of the underworld is so well done, that I felt like I was on the adventure with them. There are no boring parts to the storyline, just one action scene after another. The fight scenes were quite graphic and I only had an issue with some of the graphic descriptions (sexual in nature), but it was still worth the read. I'm looking forward to the next installment in the story. Once you start reading this series, you won't be able to stop. The author leaves you wondering what is coming next. Great, but Dark Fantasy Novella Conner has created a very dark world, just about to drop into the abyss, where mutant humans, different nations of unusual humans, several alien races and beings (who may, or may not be ancient gods and goddesses) teeter towards war and final destruction. Highly imaginative, this dark world is almost unique. The lower cities are created from garbage, the fishermen are being sought by their fish, strange beings appear, seemingly riding the fog...and someone wants to kill the protagonist before he can figure out what the heck is going on! This has been a very enjoyable, if too short read. I look forward to reading more about this strange world in the next chapter! Unusually Compellingly!!!!! !Great novel! Really a unique world. Interesting characters that are unveiled at just the right pace. Haven't read anything like it before. Amazing worldbuilding, but leaves you wanting more!Conner returns to the world of the Atomic Sea and shows his skill at worldbuilding in this latest installment: a prequel to that epic journey across a war-torn world.Here, we make the acquaintance of Tevlin Two-Bit, gambler and hustler trying to make his way in the treacherous city of Hissig, but his old underworld connections reach out and catch him in their coils once again, when he’s tasked by the local crime boss the solve a mysterious murder. His investigations lead him into a conspiracy involving a foreign power and the denizens of the mutated ruins and relics of the underworld, and it’s into that underworld he must once more venture on the very eve of the military advance of the conquering Octung Empire.Among the most striking things is the combination of realistic and the fantastic. This is a portrayal of city life, with the mix of people and technology that entails, along with modernity built on layers of history and antiquity, and that history and that technology is also fully fantastic. All the while, these characters behave realistically. Lovecraftian temples to dark gods are found under the streets, and the invading army employs high-tech alien weaponry that manipulates time, space and life itself.The story also has a deeply personal twist that ties into Tevlin’s past, and his tragic history with an old flame…My only gripe is that the story ends on a hell of a cliffhanger. Now I’ve got to wait for the next installment. "Fried rat, squid, egg wraps, grilled slugmine, bagels..."This review is from: Atomic Underworld: Part One (Kindle Edition)If you have read any of The Atomic Sea, series, you will already be aware of the fantastical imagining of Jack Conner. 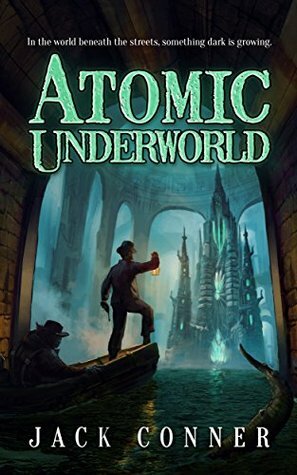 This book, Atomic Underworld, is the first of a new and separate series but set in the same world with all of the wild scenic cities and mutations so vividly brought to life by this author. The setting is, this time, underground where many of the mutated humans dwell: towns and lakes within the sewers. It is not a law abiding place but, even so, the unexplained horrendous killings which occur there bring an extra layer of fear to the inhabitants. Tavlin, an unmutated ex citizen, is recalled from above to look into the murders and the simultaneous theft of ancient jewels. What he finds is far beyond what anyone, himself included, expects and it threatens them all.This is a bizarre story set in a viscerally fantastical world with lots of action and interesting characters. A definitely different, well written read. But beware, if you start this book, the Atomic Underworld will claim you for itself and you will want to carry on to the end - and the next book to come. Jack Connor has written an imaginative st0ry that drew me in right away. The story is very descriptive which enabled me to feel as though I were there with the characters. Speacking of characters, they were interesting and a little quirky which made them believable. This is the first book by Mr. Connor that I have read and it won't be my last. I'm looking forward to the second part of this story. I received a copy o fhis manuscript from the author in exchange for an honest review. A fun weird-fiction romp, a bit noir, with engaging characters. I'll probably pick up part 2. Glad I bought volume 2!Jack Connor ending of volume 1 is a cliffhanger that makes me happy I bought volume 2! A thankful fan. I enjoyed it. Quirky and entertaining. Loved it. If you are into Steampunk, you have to read the Atomic series by Jack Conner. It's great. Made me want to read the sequel. Jack Conner - Raised in Austin, Texas, Jack Conner is the bestselling author of the Black Tower Trilogy. He's an ardent fan of fantasy, horror and weird fiction, and writes them all. He's lived all over the United States and has traveled across the world, but recently he's moved back to his beloved Austin.